Hey Friends! So, I know that it's almost St. Paddy's day, but I finally got my lesson pack together for the holiday (and I think it turned out pretty awesome)! I've already used a few things with my kids but we're going to really be focusing on it starting tomorrow. I think they're going to love the "Leprechaun Language"! 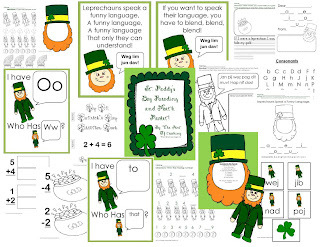 This pack includes reading and math activities for St. Patrick's Day. And of course some art activities! There are a total of 113 pages--so there's plenty to keep you busy!!! Just click here to get it on Teachers Notebook and here to get it on TeacherspayTeachers.